ADCs are very popular among LCS fans. Voting for the 2018 League of Legends All-Stars event closed today and Riot Games has released the results for the LCS regions. 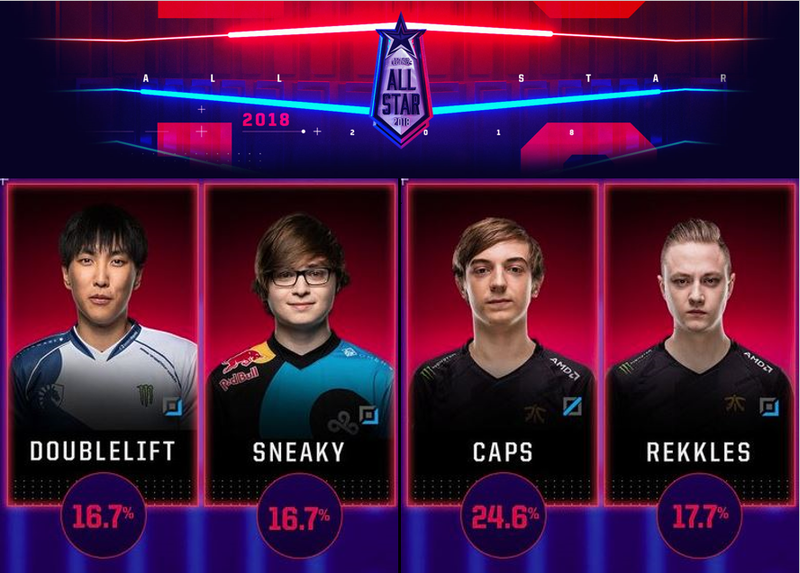 Based on fan selections, it looks like ADCs are really popular: Yiliang “Doublelift” Peng of Team Liquid and Zachary “Sneaky” Scuderi of Cloud9 were the top vote-getters from North America while Martin “Rekkles” Larsson made it in second place from Europe. Rekkles’ Fnatic teammate Rasmus “Caps” Winther was the other EU LCS representative. In past years, fans have been able to vote for five-man rosters from each region with a spot for each position. But this year, only two players from each region were allowed, which made the voting process much more important. Rekkles and Caps easily won the European vote—they play for the most popular European team after all. But in NA, Doublelift and Sneaky barely edged out Cloud9 Top laner Eric “Licorice” Ritchie and TSM mid laner Søren “Bjergsen” Bjerg for the honor of representing their region. This will be the first time in years that Bjergsen won’t be at the tournament. Voting results from the other regions have not yet been revealed. However, according to a post on the League subreddit, South Korean star Lee “Faker” Sang-hyeok is nearly a lock to make the tournament. His SK Telecom T1 teammate Bae “Bang” Jun-sik holds a very narrow lead in second place. Hopefully he makes it, because Bang wants to do a cosplay with Sneaky if he’s voted into the event—and if Sneaky agrees. In the LPL, it looks like two RNG teammates, Jian “Uzi” Zi-hao and Liu “mlxg” Shi-yu, are the early favorites. RNG is the region’s favored team, and both have built substantial fanbases through their on-stream personalities. We should find out over the next few days which players from the other regions complete the 20-person pool. The event itself will take place from Dec. 6 to 8 at the Esports Arena in Las Vegas, Nevada.